18 Months No Interest On Your Next Home Improvement Offer! Before You Buy Your Next Entry Door! Whether you buy an entry door from ABC Windows And More or another replacement entry doo r supplier or installer – make sure to consider the following entry door tips first! Make sure all entry door components are made by the same manufacturer. Often times entry door systems are assembled by multiple distributors and this is one corner you do not want to cut! Weatherstripping seals and threshold interlocks can sometimes not seal correctly at the bottom edge of the door – this is a tell tale sign of mismatch entry door parts and pieces. This entry door tip is not a deal breaker, but none the less should not be overlooked. Always check for low-e glazing on the glass windows. Most entry door manufacturers for security purposes feature glazing designed to resist security break-ins. You will find with decorative glass windows on entry doors with real lead or brass frames will cost a bit more than ones that are not the real McCoy. Look for a thermal break on high-quality fiberglass and steel entry doors. This thermal break in an entry door prevents outside heat and cold from being conducted through the frame. The thermal break also keeps frost from forming on the inside of your new entry door too! Selecting the right installer along with the right entry door will pay off in the long run with a smoother long-term operation, lower maintenance, and of course, much added energy savings. Plus, you’ll fast be the envy of all your neighbors that pass by and your guests who enter the entry door. Making a great first impression for years to come is always important. 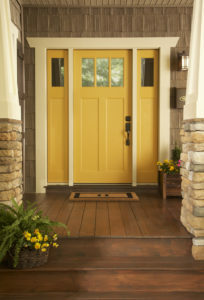 ABC Windows And More offers many options in entry doors! Click and learn more now! You at least deserve to get a home improvement estimate from us! So don’t wait – call us now at 419-931-6573 to request an in home consultation and see what ABC Windows And More offers in the best in entry doors, replacement windows, patio doors, sunrooms, and sunsetter retractable awnings! Yes, we also offer vinyl replacement siding, roofing, and much, much more. We have multiple payment options too including cash, financing, check, and credit card, too. At ABC Windows And More we strive to help homeowners get the home improvement projects completed within their budget, on time and with long term, built-in value. ABC Windows And More provides Ohio’s homeowners the flexibility to achieve the home improvement they desire today every time. Contact Us today for an in home consultation about entry doors, replacement windows, sunrooms, or retractable awnings now by calling ABC Windows And More at 419-931-6573!